Alzheimer's Moments: Beep! Beep! Escape Alert! After Mom wandered last week, I've been considering my options. Two years ago, I said I was going to fence in the yard to keep her from getting away and getting lost. Then I discovered the porch swing last year and that kept her busy. Problem solved with a better, more enjoyable, and less expensive solution. Now I'm back to the fence idea since it's winter and the swing put away down in the basement. But solutions come from odd places. I was on the phone with my bff and I heard her door chimes in the background. It is part of their home security system and each door emits a sound when it is opened. If it works to keep people out, I thought, it would work to keep people in! An added bonus is that I'll be able to sleep more soundly instead of being half asleep all night wondering if she's going to venture out. Mother dear is up a lot during the night so it wouldn't surprise me. Last night, she came in to the den where I was sleeping to tell me she didn't know where she was and what she was supposed to do. I guided her into the bedroom and told her it was time to go to sleep. Rather than waking me, she could just have easily wandered out the door at the other end of the house and I'd have been none the wiser. My shopping for door alerts began at WalMart. Nothing, although I was directed to the "child-proofing your home" area. That was the right idea even though they didn't have anything in the way of door alarms. Next was to Homo Depot and then Lowe's home improvement centers. HD had nothing, and Lowe's could special order a device for about US$60 per unit. Too much, I thought (I'm major frugal), and decided to look online since I now had the unexplored idea regarding child proofing. Lo and behold, I found exactly what I was looking for at My Precious Kid for US$10! 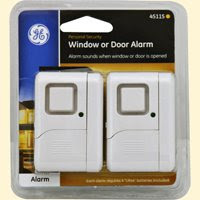 It is a GE Window or Door Alarm with entry chime mode. It has two pieces, one that attaches to the door and the other to the frame, and when the magnets inside are no longer in contact when the door is opened, a beeping sounds. Now that I have one and know that it works, I ordered two more for the other doors. I found a two pack at Jasco Products for the same price as the single I just bought. Another trick we had to keep mom from wandering overnight (when some of us were trying to get a little sleep!) was to have a two-sided lock on the front door. Both sides of the lock on the door needs a key to open (i.e. there's no lock to flip open). The real purpose of these doors was to thwart robbers when they smash in the glass/window part of the door and put their hand through and unlock the door. Hah! A better purpose is to keep your mom from wandering away at 2am. Wonderful find. Thanks for sharing!! Enjoyed this post. We had to install the same sort of alarm when our daughter was about 7 -- she sleepwalked & one night I found her trying to get our front door opened. Scary. She had no idea. So we put an alarm on her bedroom door -- it woke us up when she began to wander. I slept so much better knowing the alarm was "on guard".